﻿ Who is your 2017 MCN Man of the Year? Who is your 2017 MCN Man of the Year? After another epic season of racing, MCN’s sports team of Michael Guy (Sports Editor), Simon Patterson (MotoGP reporter) and Oli Rushby (Superbike reporter) sat down to discuss who impressed them the most in each race series we cover – and to whittle down a shortlist of exactly who was the most impressive racers of the season. With that in mind, we’ve came up with a list of six – but we need your help to cut that down to award the 58th running of our Man of the Year award! Here’s the six candidates in the running for the award, with public voting now open. Marc Marquez won his fourth premier class Grand Prix crown in five years this year after beating Andrea Dovizioso to the MotoGP crown in a dramatic final round in Valencia. 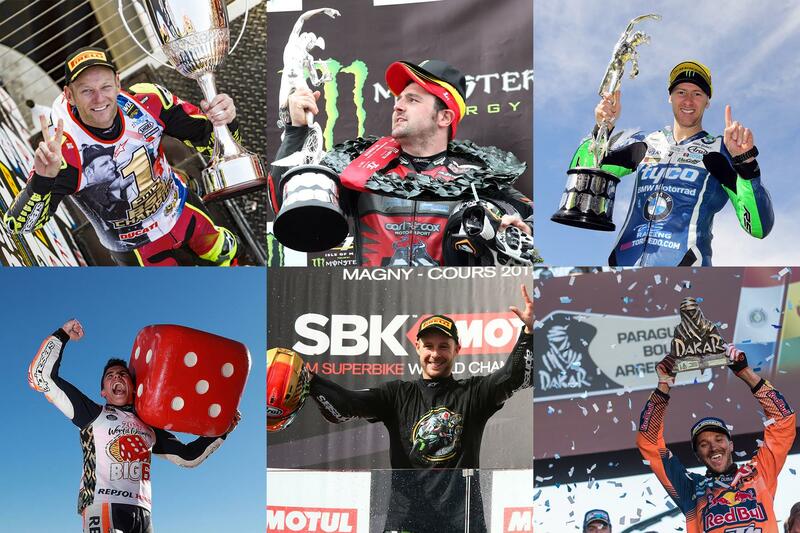 Jonathan Rea became the first person in history to win three consecutive World Superbike titles in 2017, an achievement even WSB’s most successful rider – Carl Fogarty – didn’t master. Shane Byrne won a record sixth British Superbike title after a dramatic season saw both him and rival Leon Haslam fail to score in a whopping seven races ahead of the final round. Ian Hutchinson became the third most successful solo rider around the Isle of Man mountain course as he clocked up his 15th and 16th victories at this year’s TT. Michael Dunlop took an unproven, brand new Suzuki GSX-R to victory in the most prestigious race at this year’s Isle of Man TT, decimating the opposition to take his 15th mountain course win in a dramatic Senior TT. Sam Sunderland made history early in 2017 as he became the first British rider to win the Dakar Rally since its inception in 1979. The gruelling race was tough as ever in 2017 as some of the most challenging weather conditions the event has seen saw riders fighting through the conditions.